8 Ritual Use of Cannabis Sativa L.: A Historical-Ethnographic Survey William A. Emboden Jr. The use of hallucinogens -- nonaddictive narcotics that act on the mental processes in such a way as to produce temporary altered states of consciousness -- has received a great deal of attention in recent years from both journalists and scientists; yet we know very little about how these powerful substances work, what dangers they involve, and how to control them. What we have learned is that they have potentials for good and evil, and that which potential is to be realized depends as much on who uses them, in what contexts, for what purposes, and under what kind of control as it does on the chemical properties of the substance itself. This conclusion is clearly demonstrated in the ten essays in this book, all by scholars of world-wide reputation, specializing in one or another hallucingen currently in use in a non-western society. 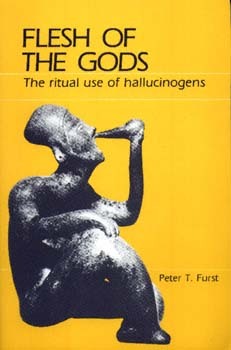 For centuries, hallucinogens have been of great significance in the ideology and religious practices of these primitive societies. In fact, the use of psychotropic plants to achieve states of religious ecstasy goes back almost to the beginning of human culture. Furthermore, the content of the psychedelic experience in the West today has been found to be similar to that of the religious pilgrimages of Oriental and aboriginal New World groups. But one fundamental difference overshadows all similarities: In the traditional cultures described in these pages, the hallucinogenic "trip" is a means to an end -- a quest for confirmation of traditional values, for unity with the tribal ancestors. In contemporary Western society, by contrast, it tends to be an end in itself and a rejection of the society's values -- perhaps, it has been suggested, because Western drug-users tend to be a-cultural. Clearly, we have much to learn from an objective study of societies with long histories of sanctioned, and controlled, drug use to achieve recognized cultural objectives.